Environmental taxes, relatively new legal instruments, will likely constitute an essential part of countries' efforts to avoid environmental degradation. 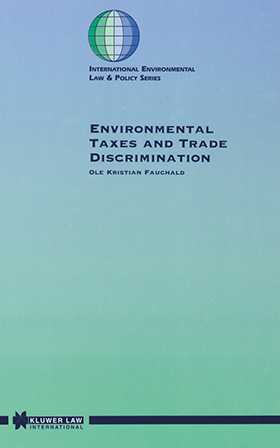 This work analyses inconsistencies in various categories of environmental taxes and the non-discrimination provisions of the General Agreement on Tariffs and Trade 1994 and how such conflicts can be resolved within the existing rules. As non-discrimination obligations are fundamental rules in the multilateral trading system, such potential conflicts carry great importance, both for the regime for the liberalisation of international trade and for environmental protection measures. This book assesses the extent to which the relevant provisions of GATT 1994 may impede the use of these taxes, in light of the non-discrimination provisions, the general exceptions, and the rules concerning nullification or impairment of benefits. The work also examines the possibilities of eliminating potential conflicts between environmental measures in general and the provisions of GATT 1994. Environmental Taxes and Trade Discrimination offers a key to understanding the complexities of and working with an unfamiliar aspect of international environmental law.